In the Spring of 2001, while a graduate student in Philadelphia, I inherited the instructorship for a Temple University continuing education course called, accurately if awkwardly, “Books You Wish You’d Read.” Everything about this gig screamed “easy money,” starting with the course title’s modest past perfect promise — no one, it seems, was expecting me to transform adult students into readers of the classics; all I had to do was turn a few classics into books they had read. Things, however, were not what they seemed. On the first day, the longest-standing members of this class, which had been meeting for over a decade, handed me a stapled list of Books They No Longer Wished They Had Read. Having long since worked through the sacred grove of classics with some other bygone graduate student they were now into the literary thicket: Frederick Rolfe’s Hadrian the Seventh, Alan Sillitoe’s Saturday Night and Sunday Morning, Elizabeth Bowen, early Dickens, Kingsley Amis. After a respectful and brief consideration of my field of expertise, they opened the term as they had every previous one: with a vote on what books they’d like to wish they’d read this term. In 2001, my BYWYR class seemed unrelated to my graduate education, which involved reading Eagleton’s “The Rise of English” in proseminar, studying high modernism and the Great Divide, and teaching Penn freshmen how to write about what literature does rather than what it says. I was training in a serious discipline; BYWYR was more of a longstanding book club that happened to occur under the auspices of Temple University — the students paying their nominal fee each term as way to offload the labor of organizing themselves, finding a meeting space, and remaining open to new members. And yet I couldn’t assimilate BYWYR to any of the sociologies of middlebrow readers or Marxist accounts of working-class adult education students available to me in 2001— the members of this group weren’t particularly class-aspirational, they weren’t into genre fiction, they weren’t Janeites. Their unexpected and haphazardly chosen reading matter coupled with their idiosyncratic interpretive interests in plant life, in domestic safety (one guy was an insurance adjustor), in conducting thought-experiments to change the race of protagonists — left them in a kind of no-man’s-land between professional critics and the readerships such critics traditionally defined themselves against. 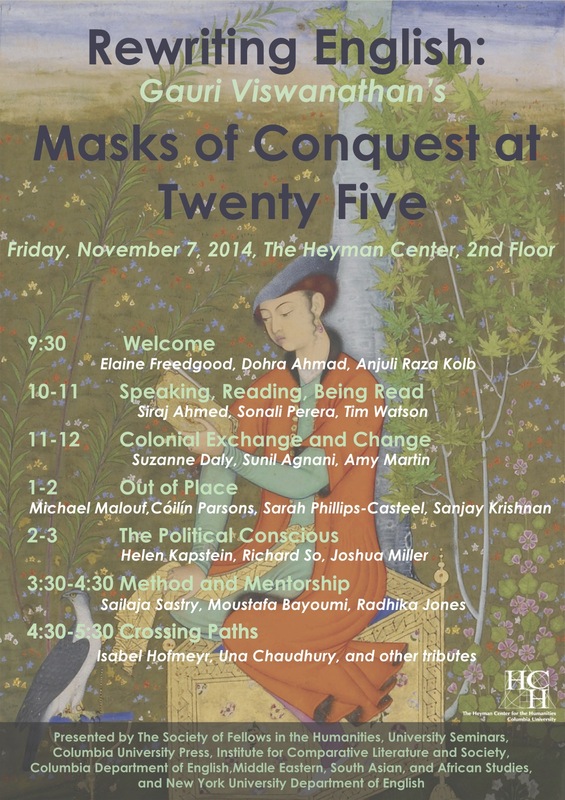 Conference Poster for "Rewriting English: Guari Viswanathan's Masks of Conquest at Twenty Five," Heyman Center, Columbia University (2014). Fast forward 15 years and that Books You Wish You’d Read class has wormed its way into how I think about the history and present of English. This shift of perspective is partly due to my own widened experiences: my early academic conception of the discipline gradually crowded out by the days and years I’ve spent practicing it in several very different universities. But disciplinary history has grown up, too — and has become more capacious in its middle age. The last few years have seen a wave of new disciplinary historical work that is newly expansive in matter and methods, including the 2014 MLQ special issue Lessons from the Past: The History of Academic English, Disciplining Modernism edited by Pamela Caughie, or Sean Latham and Gayle Rogers’s Modernism: Evolution of an Idea. And a few anniversaries of groundbreaking earlier work have reminded us of the origins of this turn. Guari Vishwanathan’s Masks of Conquest turned 25 in 2014 and was hailed with a day-long conference at Columbia University, and in 2012 the University of Sydney published a second edition of Leigh Dale’s 1997 monograph The English Men: Professing Literature in Australian Universities with an updated title, The Enchantment of English. So, too, has disciplinary history sprung up in less strictly disciplinary venues, such as John Marx’s and Mark Cooper’s Humanities After Hollywood or Public Books. First, what sorts of institutions count? Though disciplinarity by definition is extra-institutional, our ways of studying it have generally been bound to specific kinds of institutions. When Gerald Graff wroteProfessing Literature in 1987, he apologetically drew most of his evidence from “research oriented departments of English at major universities.” But how has the discipline been practiced at other colleges, universities, and extramural programs? Alexandra Lawrie’s The Beginnings of University English turns to university extension schools of the 1890s to argue that the formalist methods we associate with IA Richards and the New Critics were invented by lecturers like RG Moulton to teach contemporary novels to new reading publics. Lawrence Jackson’s The Indignant Generation is, among many other things, a history of the first generation of African-American literary critics to enter universities such as Syracuse and Hampton. And Elizabeth Renker looks again for The Origins of American Literature Studies not just at research universities like Johns Hopkins, but small liberal arts colleges, enormous public universities, and historically black colleges and universities. Elite institutions have loomed large in our genealogies, but scholars like Lawrie, Jackson, and Renker remind us that they haven’t governed intellectual work in other kinds of places. Next, do students count? The Pedagogic Criticism workshops that Ben Knights and Robert Eaglestone have organized for the past few years at the Senate House in London began by asking how disciplines are made “in the dialogues of the corridor and classroom as much as in the monograph or learned journal.” Of course, the dialogues of the corridor and the classroom can be more difficult to record and study than the scholarly debates featured in monographs and journals, but the Production of University English research project has a solution for this: they video-record English classes to see how the discipline emerges in the daily work of teaching and is practiced not only through speech and writing but non-verbal types of communication as well. The PUE project brings students into the frame of what we know and what we do as a discipline today, but how can we see the role that students have played in our past? The University of Birmingham’s Student Archive promises to do just this: they’ve collected students notes from the 1940s to the present. (Among other things, the archive makes possible a student-centered history of the Birmingham Centre for Contemporary Cultural Studies.) If disciplinary histories have imagined students as passive audience or ideal listener, these exercises in documentation and archive-building reimagine them as co-practitioners with their own interests and modes of attention. 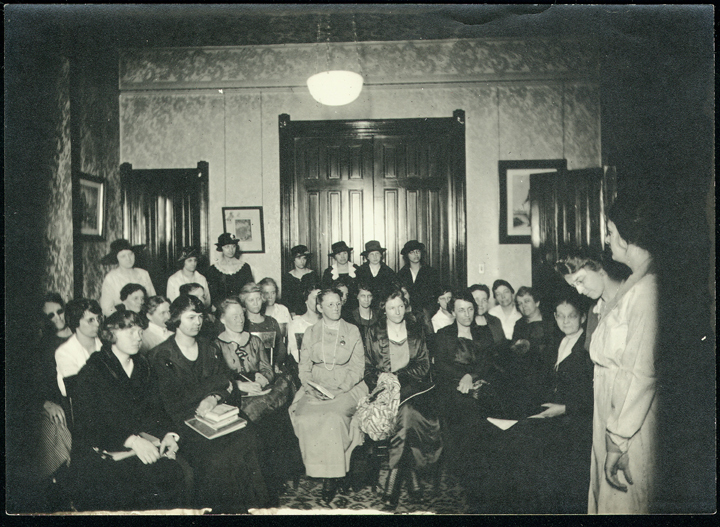 Extension school class conducted by "Mrs. Ranney" in Cortland, NY (1919). Division of Rare Books & Manuscript Collections, Cornell University Library. Do the unprofessional parts of our professional practice count? In Loving Literature: A Cultural History, Dierdre Lynch argues that the discipline of English has had a harder time than most in historicizing its basic assumptions and practices because the discipline itself confounds the structuring distinctions — between office and home, expert and amateur, knowing and feeling — that shape modern professionalism. So far, we’ve dealt with this “boundary confusion” by investigating what we know and ignoring what we feel. While many histories trace the eighteenth-century emergence of “literature” as an object of knowledge, we’ve failed to consider how this rise of “literature” as a specialized form of writing also “created a new object for people’s affections,” thus leaving unhistoricized our injunction to love literature as well as study it. Lynch’s book and others like it — Carolyn Dinshaw’s How Soon is Now?, Nancy Glazener’s Literature in the Making — pull eighteenth and nineteenth-century readers into the history of the discipline as a way to reflect upon some of the less-acknowledged aspects of our professional practices. Finally, does counting change what counts? This is the question that arises when DH meets DH — when the computational methods and data sets developed by digital humanists are focused back on the field of disciplinary history. Digital methods, far from flattening our object of study, are bringing a much broader and differently parcelled literary history into view — one that will surely nudge new critical histories into the picture. And some recent DH work has begun to focus specifically on critical history itself, most commonly by analyzing trends in language within large scholarly reference databases such as JSTOR’s Data for Research. For example, Andrew Goldstone and Ted Underwood have topic-modeled more than a century of scholarship in PMLA to see how certain groups of words likely to occur together (“topics”) have risen or fallen in popularity over time. Jonathan Goodwin has created co-citation network graphs to track who is cited (and with whom) in journals from a range of fields, including literary theory and modernist studies. And, in a similar vein, Dan Edelstein has created a range of visualizations of scholarship on the Enlightenment to grasp the shifts that have defined the field. Such approaches, Underwood and Goldstone write, are particularly good for finding disciplinary “assumptions that change quietly, without explicit debate; entrenched patterns that survive the visible conflicts; long-term transformations of the terrain caused by social change.” But so, too, have DH scholars been inspired to find new disciplinary heroes: in their recent article on “Network Analysis and the Sociology of Modernism,” Hoyt Long and Richard So look back to Shakespearean statistician Caroline Spurgeon as a forerunner, and Underwood cites RG Moulton’s 1903 position as “Professor of Literary Theory” in the University of Chicago’s “General Literature” department as indication that, alongside literary study’s signature particularism, there has also been synthesis and generalism. 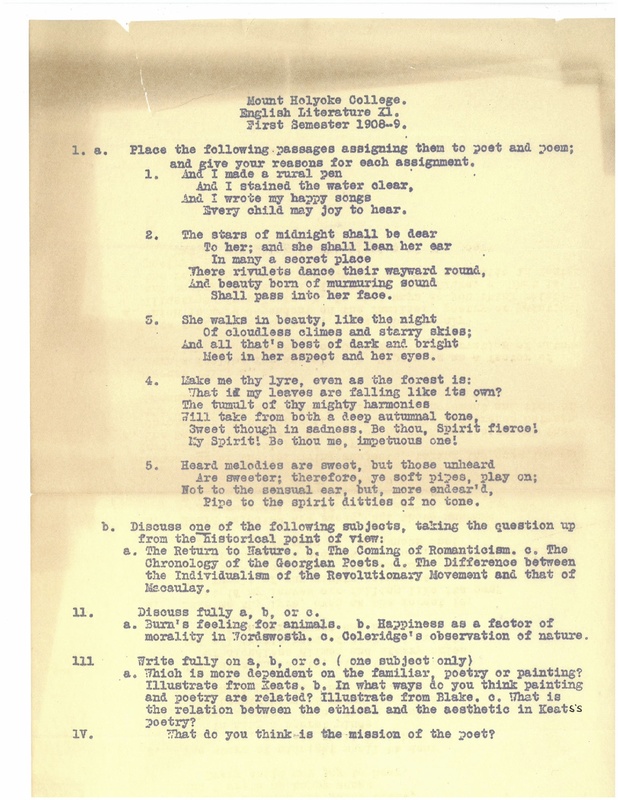 English Literature lesson from 1908-1909, likely completed by Florence M. Read, fourth President of Spelman College, while she attended Mt. Holyoke College as an undergraduate. Courtesy of the Spelman College Archives, Florence M. Read Presidential Collection. All of these disciplinary histories have repopulated our past, enlisting new documents, practices, people, moments, and schools to serve as evidence for how and what we know. So arresting are they that it’s with reluctance that I turn to the broader frame – the question of why now we are redrawing our boundaries and retracing our genealogies by folding in what once seemed – like the Books You Wish You’d Read crew— invisible or undisciplinary. How we historicize this moment is important, for it will determine whether we read this genre today as elegy, proleptic mourning, a gathering of resources to face a precarious future, or joyous jettisoning of debilitating disciplinary narratives. And, let’s face it, disciplinary history wouldn’t be recognizable without the anxious self-reflection native to the mode. For now, though – for this year of the “Discipline” column— let’s linger and enjoy the new views.